LOWELL, Mich. (June 17, 2013) – MotorGuide, a trusted fishing brand with more than 50 years of engineering and manufacturing trolling motors, introduces Pinpoint® GPS navigation available on its new Xi5 wireless trolling motor. Pinpoint GPS delivers on-target location accuracy that enables anglers to precisely position their boats and achieve optimum boat control. Through a compact, easy-to-use hand-held remote, Pinpoint GPS enables anglers to move a boat in five-foot increments in any direction and store up to 8 locations when in “anchor” mode. “Being able to position and jog your boat to make the best possible presentation of the bait is essential to catch fish, and Pinpoint GPS enables anglers to precisely position their boats to stay on fish and bring home a bigger catch,” Curtis said. Pinpoint GPS features “heading lock” and “cruise control” options to navigate the boat to specific compass headings while holding a constant speed against wind and current. In its “route memory” mode, Pinpoint GPS can store and recall up to eight routes of four miles each. 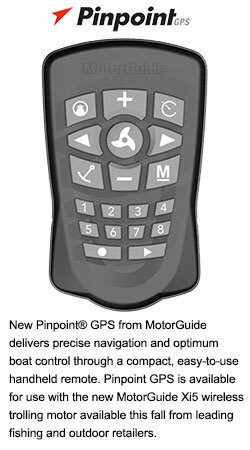 Pinpoint GPS is available this fall as a factory-installed upgrade or as an easy to install option that anglers can purchase from retailers for use on the new MotorGuide Xi5 wireless trolling motor.